What is Middle School Chorus? This group performs a fun and varied repertoire of choral music. No experience is necessary for this instructional class designed for students in grades 6-8. The Middle School Chorus performs twice a year, once in December and once in May. Performance attire - Young Men: Black pants, black socks, black shoes, black bow tie with white tuxedo shirt. Ladies: All black (shirt/skirt/pants or dress) with black shoes. 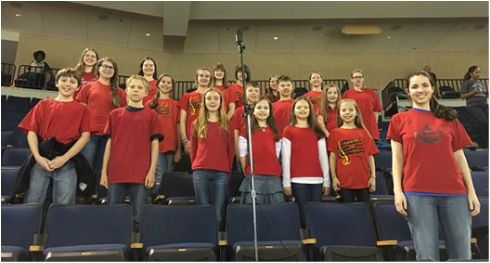 Middle School Chorus singing our National Anthem before an Atlanta Gladiators hockey game! The choirs get some amazing opportunities to perform!